Steve Clarke has been tipped to win manager of the year by the man he replaced at Kilmarnock. 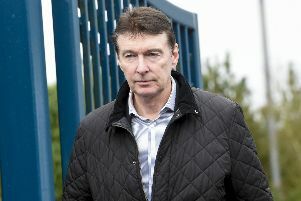 When Lee McCulloch vacated the job at Rugby Park in October, Kilmarnock were at the foot of the Premiership table, having taken only two points from their opening six matches. Five months later, his successor has propelled them to fifth place and, in the 26 games since McCulloch’s departure, only Aberdeen and Hibernian have beaten the Ayrshire club. “What they’ve done has been unbelievable, fantastic,” McCulloch said. “To cement a top-six finish, having possibly underachieved for the last eight years, is great. “Steve has done a great job and, for me, he is manager of the year... so far. “The only thing that’ll prevent him from getting that title is if Celtic [retain the league and Scottish Cup]. McCulloch also believes Killie’s veteran striker Kris Boyd is in with a chance of winning player of the year. The 34-year-old is enjoying an Indian summer, having scored 20 goals this season. “I once said that Boydy was worth his weight in gold – so that’s a lot of money!” McCulloch said.